NOTE.-That is, affix the signature of royalty, that it may have the proper authority, and thus be of force. Anciently it was customary for kings to use a ring, containing their name, initials, or monogram, for this purpose. Jezebel, the wife of Ahab, “wrote letters in Ahab’s name, and sealed them with his seal.” 1 Kings 21:8. Of the decree issued under Ahasuerus for the slaying of all the Jews throughout the Persian Empire it is said that “in the name of King Ahasuerus was it written, and sealed with the king’s ring.” Esther 3:12. What are the three essentials to an official seal? With what is God’s seal connected? Does the first commandment show who the author of the law is? NOTE.-Who the “me” here spoken of is, the commandment itself does not state. Such a prohibition might come from any source. Any heathen could claim it as a command from his god, and, so far as the commandment itself goes, no one could disprove his claim. Does the second, third, fifth, sixth, seventh, eighth, ninth, or tenth commandment indicate the author of the decalogue? NOTE.-The second commandment forbids the making of and bowing down to images, but does not in itself reveal who the true God is. The third commandment says, “Thou shalt not take the name of the Lord thy God in vain,” but it likewise fails to reveal the true God and giver of the law. A worshiper of the sun might say he kept this commandment so far as it itself reveals what god is meant. So of the other commandments here referred to. In the last five commandments the name of God is not even mentioned. Which commandment alone of the decalogue reveals the true God and Author of the law? “Remember the Sabbath day, to keep it holy. Six days shalt thou labor, and do all thy work: but the seventh day is the Sabbath of the Lord thy God: in it thou shalt not do any work, thou, nor thy son, nor thy daughter, thy man servant, nor thy maid servant, nor thy cattle, nor thy stranger that is within thy gates: for in six days the Lord made heaven and earth, the sea, and all that in them is, and rested the seventh day: wherefore the Lord blessed the Sabbath day, and hallowed it.” Isa. 8:8-11. OTE.-The fourth commandment alone reveals the name, authority, and dominion of the Author of this law. In six days, (1) the Lord (name); (2) made (office, Creator); (3) heaven and earth (dominion). This commandment alone, therefore, contains “the seal of the living God.” By what is revealed in this commandment is shown what God is referred to in the other commandments. By the great truth revealed here all other gods are shown to be false gods. The Sabbath commandment, therefore, contains the seal of God; and the Sabbath itself, the observance of which is enjoined by the commandment, is inseparably connected with this seal; it is to be kept in in memory of the fact that God is the Creator of all things; and it is itself called a “sign” of the knowledge of this great truth. Ex. 31:17; Eze. 20:20. What reason does God give for the Sabbath being an everlasting sign between Him and His people? “It is a sign between Me and the children of Israel forever: for in six days the Lord made heaven and earth, and on the seventh day He rested, and was refreshed.” Ex. 31:17. NOTE.-The Sabbath is the sign, or mark, or seal, of the true God, the Creator. Of what does God say the keeping or hallowing of the Sabbath is a sign? Of what besides a knowledge of God as Creator, is the Sabbath a sign? “Verily My Sabbaths ye shall keep: for it is a sign between Me and you throughout your generations; that ye may know that I am the Lord that doth SANCTIFY you.” Ex. 31:13. NOTE.-The Sabbath is the great sign of God’s creative power wherever and however manifested, whether in creation or redemption; for redemption is creation- re-creation. It requires the same power to redeem that it does to create. “Create in me a clean heart.” Ps. 51:10. “For we are His workmanship, created in Christ Jesus unto good works,” Eph, 2:10. At each recurrence of the Sabbath, God designs that it shall call Him to mind as the One who created us, and whose grace and sanctifying power are working in us to fit us for His eternal kingdom. What scripture shows that a special sealing work is to take place just before the letting loose of the winds of destruction upon the earth? “And after these things I saw four angels standing on the four corners of the earth, holding the four winds of the earth, that the wind should not blow on the earth, nor on the sea, nor on any tree. And I saw another angel ascending from the east, having the seal of the living God: and he cried with a loud voice to the four angels, to whom it was given to hurt the earth and the sea, saying, Hurt not the earth, neither the sea, nor the trees, till we have sealed the servants of our God in their foreheads. And I heard the number of them which were sealed: and there were sealed an hundred and forty and four thousand of all the tribes of the children of Israel.” Rev. 7:1-4. See Eze. 9:1-6. Where did the apostle see this same company a little later, and what did they have in their foreheads? “And I looked, and, lo, a Lamb stood on the mount Sion, and with Him an hundred forty and four thousand, having His Father’s name written in their foreheads.” Rev. 14:1. NOTE.-The seal of God and the Father’s name must refer to the same thing. The seal is the sign or stamp of perfection and God’s name stands for His character, which is perfection. And the Sabbath of God, kept as God ordained it to be kept, holy, and in holiness, is a sign of this same thing- perfection of character. When this seal is finally placed upon God’s people, it will be an evidence that His grace and His sanctifying power have done their work, and fitted them for heaven. In the world to come, all will keep the Sabbath, and will therefore have this seal or mark of sanctification, holiness, and perfection of character. Isa. 66:22,23. What is said of the character of these sealed ones? “And in their mouth was found no guile: for they are without fault before the throne of God.” Isa. 66:5. 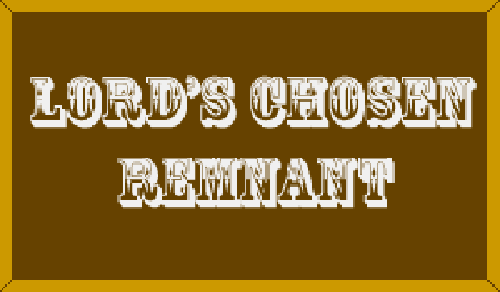 How is the remnant church described? the commandments of God, and the faith of Jesus.” Isa. 66:12. “And the third angel followed them, saying with a loud voice, If any man worship the beast and his image, and receive his mark in his forehead, or in his hand, the same shall drink of the wine of the wrath of God.” Isa. 66:9, 10. NOTE.-The beast represents the Papacy; the image to the beast represents another ecclesiastical body dominating civil power. See readings in A Great Persecuting Power & Making an Image to the Beast section on the site. And over against the seal of God stands the mark of the beast, the mark of apostasy. Against this false and idolatrous worship and the reception of this mark, God sends this solemn warning. What power mentioned in the thirteenth chapter of Revelation is to enforce this mark? NOTE.-The two-horned beast is understood to represent the United States of America. See reading in Making an Image to the Beast section on the site. As this nation repudiates her principles of civil and religious liberty, and becomes a persecuting power, other nations will follow her example in oppressing those who refuse to yield their allegiance to God. What does the Papacy set forth as the mark, or sign, of its power and authority? “Answer.–By the very act of changing the Sabbath into Sunday, which Protestants allow of.”- “Abridgment of Christian Doctrine,” by Rev. Henry Tuberville, D. D., page 58. NOTES.-In a letter written in November, 1895, Mr. H. F. Thomas, chancellor to Cardinal Gibbons, replying to an inquiry as to whether the Catholic Church claims to have changed the Sabbath, said: “Of course the Catholic Church claims that the change was her act, . . . and the act is a mark of her ecclesiastical authority in religious things.” See readings in The Change of the Sabbath & Sabbath Reform Sections. The true Sabbath being a sign of loyalty to the true God, it is but natural that the false sabbath should be regarded as a sign of allegiance to apostasy. And such we find to be the case. “The observance of Sunday by the Protestants is an homage they pay, in spite of themselves, to the authority of the [Catholic] church.”- “Plain Talk About the Protestantism of Today,” by Monsignor Segur, page 213. NOTE.-The statement here made is true, and a full realization of the fact will lead those who honestly, but ignorantly, have heretofore been observing Sunday as the Sabbath, to refuse longer to pay homage to apostasy and return to the observance of that which is the sign of loyalty to heaven,- the only weekly day of rest which God, in His Word, has commanded men to keep holy, the seventh day. What will be the dragon’s attitude toward the remnant people who keep the commandments of God? “And the dragon was wroth, with the woman, and went to make war with the remnant of her seed, which keep the commandments of God, and have the testimony of Jesus Christ.” Rev. 12:17. How strongly will this false worship and the enforcement of this mark be urged? “That the image of the beast should both speak, and cause [decree] that as many as would not worship the image of the beast should be killed. And he causeth all, both small and great, rich and poor, free and bond, to receive a mark in their right hand, or in their foreheads: and that no man might buy or sell, save he that had the mark.” Rev. 13:15-17. Over what do the people of God finally gain the victory? “And I saw as it were a sea of glass mingled with fire: and them that had gotten the victory over the beast, and over his image, and over his mark, and over the number of his name, stand on the sea of glass, having the harps of God.” Rev. 15:2. Upon the seventh a rest enjoyed. ‘Twas made for man, ’twas made for all.